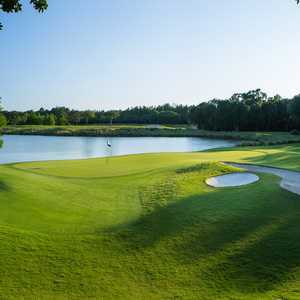 The Slammer & The Squire is an 18-hole, par 72, 7,000-yard championship resort golf course designed by Bobby Weed with design consultants "The Slammer" Sam Snead and Gene "The Squire" Sarazen. The course is the host site of the Liberty Mutual Legends of Golf, a Senior PGA tour event. It features two distinct nines. The front nine meander through an old pine forest linked together with wetland corridors to protect the indigenous vegetation and wildlife. 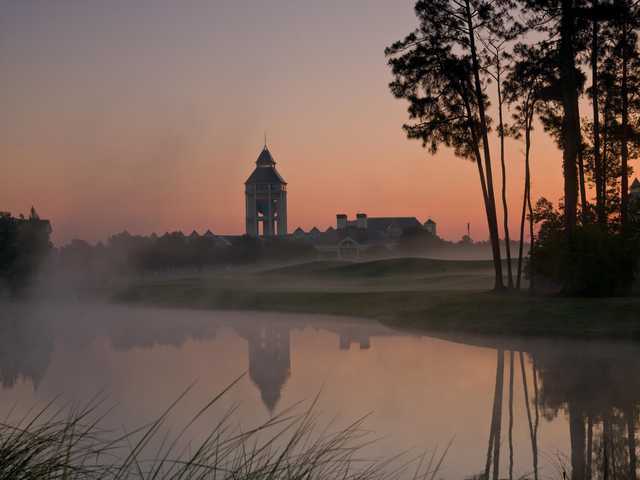 The back nine, bordering the World Golf Village, finishes with a breathtaking view of the World Golf Hall of Fame that towers above the 18th green. 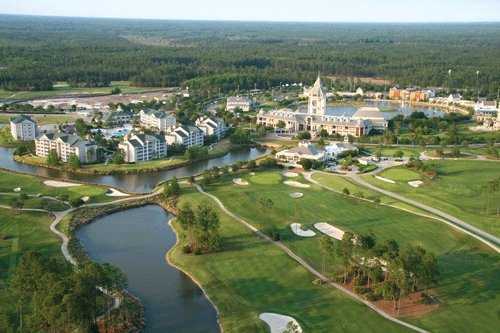 If you’re into golf, one venue on your bucket list should be the World Golf Village in St. Augustine, FL. There’s plenty to do there, for example, you could spend all day at the World Golf Hall of Fame, taking in all the exhibits, viewing movies in the IMAX theater and testing your stroke on the Challenge Hole – reminiscent of Number 17 at Sawgrass. Or, if you’re looking to play a round of golf designed by a couple of legends, you can book a round on the Slammer and Squire Golf Course, one of two courses connected with the World Golf Village. 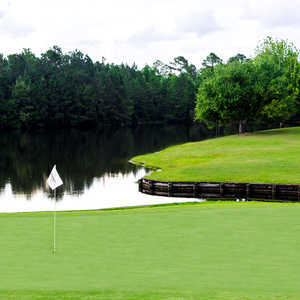 The Slammer & Squire Golf Course is the property’s original course and is located just a wedge shot away from the World Golf Hall of Fame. It was designed by noted golf course architect Bobby Weed with considerable input from the course’s namesakes: Sam "The Slammer" Snead and Gene "The Squire" Sarazen. Five sets of tees plus a blended set – a combination of the Blues and Whites – makes The Slammer & Squire enjoyable for any golfer – provided you play from the set that best suits your game. From the back (Stone) tees, the course plays 6,939 yards with a course rating of 72.7 and a slope of 127. The Blue tees at 6,132 yards (69.2/121) will challenge most golfers and still enable them to leave with a little dignity. Ladies will find the Green Tees at 4,996 (68.0/115) an enjoyable test. The Slammer & Squire opened to the public in May 1998 and features two distinct nines. 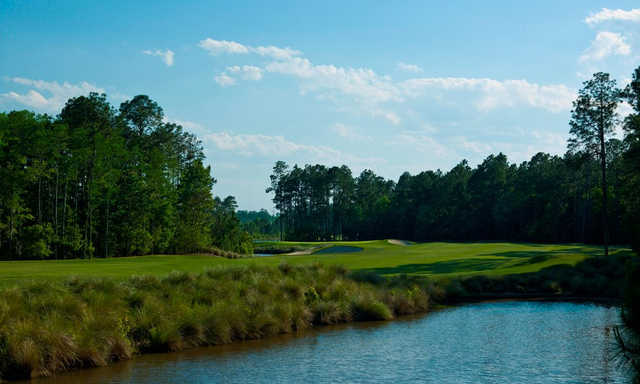 The outward nine traverses through fairways lined with giant Loblolly pines, while wooden pathways and bridges guide you through traditional Florida wetlands. On the back nine you will find generous fairways, contoured greens, and plenty of water hazards. You’ll also be treated to impressive views of the World Golf Hall of Fame. Just behind the pro shop is a full length driving range with plenty of targets, a large practice putting green as well as a short game area that includes a sand trap. The Clubhouse has a fully stocked pro shop with lots of logoed gear from a number of top apparel companies as well as Men’s and Women’s locker rooms complete with showers. Inside the clubhouse you’ll also find the Legends Grille where both breakfast and lunch are served. The food is reasonably priced and very delicious. I highly recommend the Philly Cheesesteak Sliders or the Caribbean Fish Tacos after a round of golf. The bar has all of your favorite libations as well as several domestic and craft beers on tap. Favorite Par 3: Number 7, 143 yards. This hole is truly a shotmaker’s delight. Fashioned after The Redan, the famous 15th at North Berwick, the flag can be attacked either by carrying the bunkers straightaway, or better yet, by fading a tee shot. This allows the ball to feed down to the hole. Miss the green and you’re most likely staring a big number right in the face. No wonder The Redan is the most copied par 3 in all of golf. Favorite Par 4: Number 1, 358 yards. The wind will dictate how difficult this hole plays. Keep your tee shot left of the right-side fairway bunkers on this dogleg right. Make it to the dogleg off the tee and you’ll have a short approach to the slightly crowned green. Par – or better – is a good way to jump start your round. Favorite Par 5: Number 16, 527yards. The last three holes are a daunting task and feature the longest par 5 and the longest par 4 on the course. Shot placement off tee is essential on #16. If you’re feeling good about your game thus far, you may want to take an aggressive line over the fairway bunkers in an attempt to get home in two. Should you choose to layup, you must avoid the left hazard as well as the trees on the right side. The green’s false front slopes heavily back towards the fairway. Last Word: The Slammer and the Squire provides a challenge regardless of which tees you play from or how good you are. Low handicappers will be challenged by a number of risk/reward opportunities; playing these holes smartly will yield a low score. High handicappers will be glad to know that the greens are pretty straight forward with not a lot of hidden breaks and subtle undulations. They are quick, running about 11 or 12 on the stimpmeter. There’s a full length driving range as well as a large practice putting green and short game area to hone your skills. Should you arrive hungry or get so during your round, the Legends Grille is a great place to grab breakfast or lunch. The food is very good as are the portions. You won’t leave hungry. Not what one would expect. Dropped clubs at bag drop and had to wait 10-12 minutes for cart to pick us up. While at bag drop, ash trays were overflowing and I watched 3 employees put out their cigarettes and never thought about emptying it. Course tee boxes were unkept, course direction signs were non-existent. Not sure where next tee box was located. Greens were good, but, it appeared players do not know how to fix pitch or ball marks. (Not the courses fault). After play, no one at back drop to greet us, clean clubs, and take to our cars. Positive: golf shop was very nice and asst pro very accommodating. Needs some management, both course superintendent, and overall customer service areas. Common area ground maintenance seriously lacking. Course layout challenging, but many corrections to be made before playing again. OUTSTANDING ALL AROUND !!!! CART GIRLS ARE THE BEST !!!!! Beautiful Course, great lay-out, pleasure to play, pro-shop personnel were terrific! !